Tenerife is covered in beautiful paths that lead through stunning landscapes. If you tried to walk every single one of them, you’d be walking nonstop for months, if not years! To help you out with the countless offers and options, we have created a list of the most unique and most popular trails Tenerife has to offer. We will try to give you an idea about the level of difficulty as well as a map or detailed description and, if needed, a link to the website of one of our favorite tour guides. The North offers the most beautiful views and landscapes of the island. Due to the higher volume of rain, it is a lot greener and the vegetation is more varied here than in the South. The coastline in the North has stunning cliffs and rock formations to discover. The following routes offer the greatest views and best hiking experiences in the North of Tenerife, in our opinion. On this hike, you will get a good view on the coast line of the north with its spectacular rock formations as well as a wide range of vegetation. The highlight of the tour is the ruins of an old pump building called Estación de bombeo de la gordejuela or in short Casa del agua. Starting at the Maritim Hotel, which is the big blue building just behind Loro Parque, coming from the center of Puerto de la Cruz, you will find a path that leads you to the rock formation “Los Roques” which emerges from the sea, very close to the coast. Following that path, you will end up in the streets of “La Romantica 2” and following the signs that point to “San Pedro” also cross “La Romantica 1”. Once you pass a blue building, you are on the hiking trail along the coast again, which you will stay on until you reach the “Rambla de Castro”, an area that is being taken care of beautifully in terms of vegetation. Above this area, you will find the viewpoint “Mirador de San Pedro” with a small restaurant. From there, you can either take a bus or taxi back to town, or you get a drink and tapa at the restaurant to regain your strength and walk back the same way. One way takes about 1.5 hours. If you choose to take the bus back to Puerto de la Cruz, bus 363 and 353 pass by San Pedro. On this hike, you will witness the different climate zones that Tenerife has to offer and the varied vegetation that comes with it. The path also leads you to the “Cuevas Negras” or “black caves” which is yet another impressive volcanic construction on the island. The path connects the mountain town Erjos and the coast town Los Silos. It is up to you whether you want to start in Erjos and go down, or depart from Los Silos and walk up the mountain. 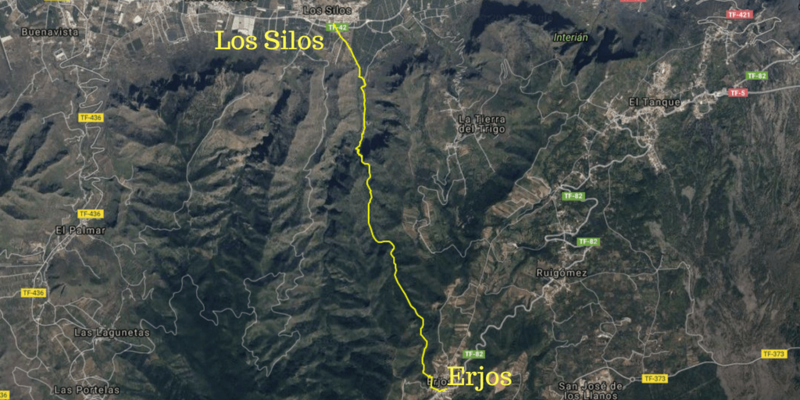 Obviously, starting in Erjos is easier for your heart and muscles, whereas starting in Los Silos is easier on the knees. It’s important to note that the trail is pretty steep almost the entire way, the entire route takes around 3 hours, so decide for yourself which route works best for you. It is likely that you will be in the clouds when you’re in Erjos, so bring warm clothing. From both directions, there’s signs leading the way. The path is called PR TF-53. 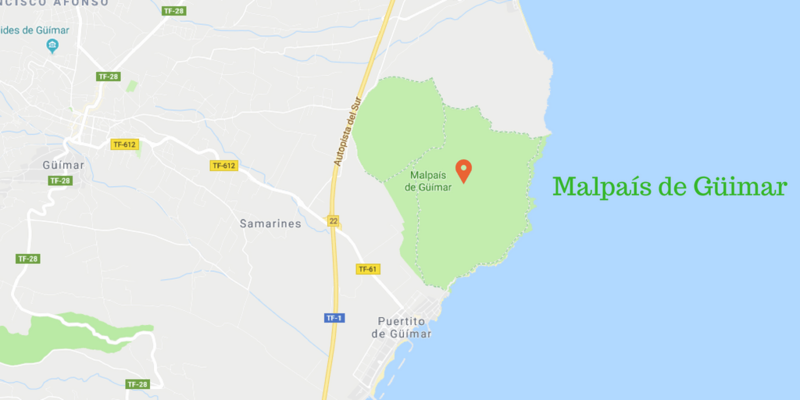 If you’re staying in Puerto de la Cruz, you will need Bus 325 to go to or leave from Erjos and Bus 363, going from Taoro Park in Puerto to Los Silos and vice versa. The Chinyero eruption is the most recent eruption that took place in 1909, causing the volcanic landscape there to be the newest on the entire island. If you have a car, the recently constructed pass along the coast of El Sauzal is a nice short walk suitable as an afternoon activity. It offers solid ground to walk on, beautiful views of the sea and the coast and a few signs that show the old fishing towns that used to be located in the rock formations. You will also have a view of “Esqueleto”, the ruins of an old hotel that has never been completed. To get to the walkway, you will have to take the exit of la Matanza, then at the roundabout take the exit towards “El Caletón” and after 50 meters you will find a right turn pointing to “El Sauzal”. On the left hand side, you will find a road that has a sign with the opening hours and a gate. Follow that road and you will get to the walkway. The road is open from 8am to 7pm in the winter and from 8am to 10pm in the summer. The walk along the coast will take approx. 45 minutes. On this approx. 10 km long hike, you will start out in the Anaga forest and spend the first 1-2 hours walking through the woods, before entering a new climate zone with divine vegetation and auburn colored rock formations. You will be going downhill almost the entire time. Going in direction of Punta del Hidalgo, you will have the option to pass through Chinamada, which is an old town that demonstrates how the natives, the old Guanches, used to live in cave houses. It’s definitely worth the detour. The hike starts at the meeting point Cruz del Carmen. There, you will find free parking, a restaurant and a viewpoint. If you come by bus from Puerto de la Cruz, take the bus 102 to La Laguna and from there the bus 076 or 077 to Cruz del Carmen. On the right hand side of the restaurant, you will find a sign with multiple paths pointing to Punta del Hidalgo. Follow the path PR TF 10. Right before the town of Chinamada, you will be given the option to take the mentioned detour called PR TF 10.1, which will lead you to the cave houses and back on the original path. Once you get to Punta del Hidalgo, the Bus 050 will take you back to La Laguna, from which you can either pick up your car or take the bus back to Puerto de la Cruz. Passing through tunnels and walking in old water canals – nothing for people with vertigo! On this 6-7 hour hike with a distance of approx. 12.7 km, you will experience a lot of difference in altitude, going down the hill with an occasional mountain to climb. You will start out at the Anaga Forest and walk through the woods the first 1-2 hours, before reaching the small town Batan, where you will have to go up and over the mountain on the left hand side. On the top you will find a spectacular rock formation. Then, going down the mountain on the other side, you will be walking on a normal road. Watch out for a red bunker on the right side about 50 meters from the road. There’s a footpath leading to it and once you’re there, you will find a small trail going through the valley which will be 80% covered in plants. If you follow that path, you will reach the entrance of the Bejia Canal. For the first tunnel, you will need a flashlight because of its length. You will be able to walk upright the entire time. Walking in the water canal, you will have a spectacular view on the steep valley and the mountains on the other side. It is not dangerous but it’s also not for you if you are afraid of heights. Once you leave the water canal, stay on the trail on the left to go over the mountain ahead of you and finally walk down to Punta del Hidalgo. The descent will be very steep and hard on your knees. 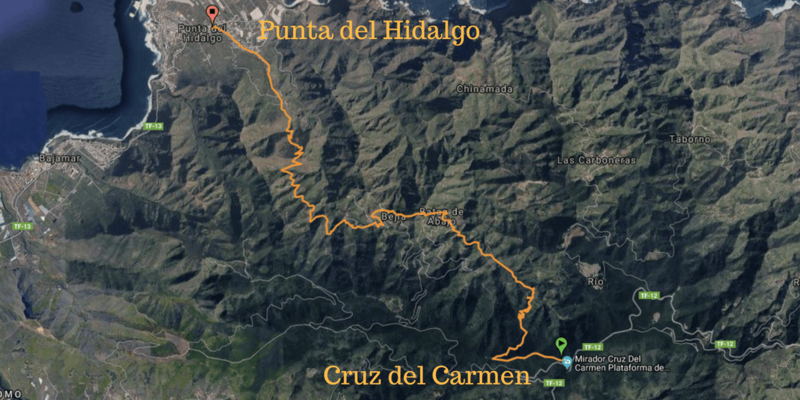 Just like the hike mentioned above, you will start at Cruz del Carmen and finish in Punta del Hidalgo. But instead of taking the trail PR TF 10, you will follow the signs of the trail PR TF 11, at least until you get to the red bunker. The tunnels are part of a detour that is not listed as an official trail. You will automatically get back on the PR TF 11 trail once you leave the water canal though. This hike follows the trail that used to be the only connection between Taganana and La Laguna / Santa Cruz. You will start at the Casa Forestal and just follow the path, constantly turning left and right due to the many bends that the trail is famous for. On this hike, you will be in forest the entire time and be able to take in the full range of the vegetation of the North. It is a nice 2.5 hour hike with a distance of about 4.5 km. To get to Casa Forestal, you can either take the bus 102 from Puerto de la Cruz to La Laguna and from there, switch to the bus 076 which will pass the Casa Forestal directly, or, if you go by car, stay on the road TF12 and watch out for signs pointing to the “Casas de las Cumbres”. The south has completely different scenery to offer than the north. Most of the year it is much warmer and much drier, at least along the coast. You won’t find as much vegetation on most of the hikes in the South of Tenerife, but you will get a different feeling for the island and its variety. The hikes listed above are definitely some of the most beautiful ones on the entire island. If you are into hiking, this one is a must for you. It is Tenerife’s most famous and most hiked trail. On this 3-4 hour hike, you will descent into the impressive gorge of Masca and be surrounded by massive stone walls. You will walk along creeks that have originated from the melt water from the Teide and over rocks that are as smooth as can be from the water flows that passed through this gorge hundreds of years ago. At the end of this hike, you will reach the Masca beach where you can go for a swim and either take one of the boats that will bring you to Los Gigantes or go back up the same way. Only go for the second option if you are in good shape though. To get to Masca by bus, take the bus 363 from Puerto de la Cruz to Buenavista del Norte and from there switch to bus 355 to Masca. If you choose to take the boat to Los Gigantes, the bus 325 will bring you directly from Los Gigantes back to Puerto de la Cruz. If you have a car, we recommend you park it at Santiago del Teide and take the bus 355 from there to get to the starting point which is Masca. Later on, you will be able to catch the bus 325 at Los Gigantes to get back to Santiago del Teide and pick up your car. The hike to the Barranco del Rio will take you approx. 5 hours as you will have to go back the same way you came and has an intermediate difficulty level. You will see the many faces of the South, including dry desert-like zones, a few surprisingly green spots and, as a highlight, the still running waterfall Barranco del Rio. It is one of the more diversified hikes in the South. To get there, you will need a car. Take the Exit “Chimiche, El Rio” from the TF1 which is the main highway in the south and follow the signs leading to “El Rio”. The road should pass by a church and end in a parking lot, where you can park the car and start following the trail. This hike is, again, not for people with vertigo or claustrophobia! You will need a flashlight that is in good condition for the first part and most importantly, you will need to be very careful. The Mil Ventanas Hike goes along the water canals of Guimar. The tunnels you will have to walk (and at parts crawl) through have been built by the Guanches hundreds of years ago. The holes in the tunnels displaying the mountains on the other side and the valley below are called “Mil Ventanas” or thousand windows. In between the canals, the trail is very narrow and there is no sort of fence or boundary keeping you from going down the cliff, which is why you will have to be extremely careful and also why this hike is nothing for people that are afraid of heights. The safest way to do this hike is to go through the first 8 tunnels and then turn around and go back the same way. This is also easiest as you have no option to get to the starting point by bus. To get to the starting point, you will need to take the exit “Guimar” from the TF1 and keep going towards the town. You will automatically pass the town while going up the hill. Once you have left the town and are driving along the mountainside, watch out for a smaller, very steep road on your right side going up a hill. Follow that road until you reach a red and white striped small tower. Park your car there and start following the dirt road that continues to lead up the mountain. This is the part that you will need good condition for as it is very steep. After passing a tower with satellites attached to it, walk straight on, staying on the dirt road that is often used by dirt bikes. On the right side, you will find a small sign that will have “1000 ventanas” written on it by hand with a pen. That’s where the path starts. Right in front of the first tunnel, there’s a crushed digger that has been attached with cable rope to prevent it from falling down further. From there on, the real adventure begins. 8 tunnels will await you, and the holes in them will hold stunning views on the landscapes of Tenerife. On this easy 2-3 hour hike, get to know the characteristics of nature in the South of Tenerife. This round trip will offer you a wide variety of terrain to walk on, cacti to (literally) look up to (because of their size) and volcanic rock formations to discover. To get to the starting point of this easy hike, take the “Guimar” exit at the TF1 and follow the signs leading towards “El Puertito”. Following down the main road, you will find a parking lot on your left. With the ocean on your right hand side, find the road that is closest to the sea. That’s where the hike starts. It is a round trip, so you will get straight back to your car, making it nice and simple for you. We recommend going up and towards the small mountain at first. Don’t worry- you won’t have to go up the mountain. If you follow the trail and stay in between the mountain and the coastline, you’re good. The trail leads through an area full of oversized cactuses, through landscapes that will remind you of the desert, and finally along the coast with its volcanic rock formations and the ocean on your left hand side. It is a beautiful hike that resembles the South of Tenerife perfectly. It can be done with the whole family and you won’t need a guide. There are countless hikes at Teide National Park you can do. The whole area is covered in trails that are all similar to each other, in terms of the views you will get and the ground you will walk on. Bus 348, departing from Puerto de la Cruz will take you right to the Teide National Park and from there, you can go in pretty much any direction and you will find a trail. Since there are so many different options for Hiking in Teide National Park, Tenerife, we only have one special hike to introduce to you that stands out in our eyes. But careful – this hike is of moderate to high difficulty and not for beginners. It should definitely be done with a guide and when you’re in good health. There are multiple options if you want to hike up to Pico del Teide. Note that to get all the way to the top, you either need permission by the Ministerio de Santa Cruz, which you can obtain only by showing up there with your passport a few weeks ahead or applying online for an access permit here, or you have to be at the gate at 3550m altitude again before 9 in the morning. For that, it makes sense to start your hike at night which can be more pleasant either way as the sun is really strong up there during the day. Another option would be to stay a night at the Altaviste Refuge at 3260m to acclimatize to the altitude. You could hike up there after the sun sets, get some rest and then keep going early in the morning to ensure that you will get back to the gate from the Pico del Teide before 9 in the morning. As mentioned before, we think that it is best to do this hike with a guide, especially if you want to do it at night to avoid having to obtain a permission. Obviously there are hundreds of different hikes you can do while you’re in Tenerife and the Canary Islands, these are just a handful of our personal favorites. Due to the variety of Tenerife’s landscape you can always find a hike regardless of what walking level you are. We hope you enjoy exploring this beautiful island as much as we do! 367 queries in 3.215 seconds.